Over the last few months, I have gotten countless emails regarding my beauty products from readers who, like me, are “natural & organic type people” & some are also gluten free (as I am), asking me what beauty products I use & trust. I thought it might be a good time to share what I am using & how I arrived with a new makeup bag full of natural & gluten free products! I have been totally gluten free since the spring of 2010. I have only intentionally cheated once—right when I found out I had the celiac. Let’s just say I was testing the doctor and I ate about one bite of cake and about an hour later I was gripping my sweet hubby’s arm crying & begging him to never ever let me do that again. Needless to say, I don’t cheat. EVER. I am totally gluten free & about 85% natural & organic in everything I eat. Is it hard? Yep, especially at first because it was an entirely new lifestyle, but now I wouldn’t go back if you paid me. I am healthy, happy and feeling better than ever. I must admit though, it was an extremely challenging road getting here. About a month ago I had an appointment with a dermatologist… I had a weird rash on my face and we wanted to be proactive… after all, you only have one face! Anyways, we talked about my makeup products, shampoo & conditioner & hairspray. Did you know your skin soaks in about 60% of what you put on it? Yeah, me either. You might remember me mentioning my new Mary Kay products back in a November of 2011 blog post, well they are gone now. All of them. Basically, the news from my dermatologist was to go organic, go natural & go gluten free for EVERYTHING. She explained to me I would be crazy to use anything on my face that contained chemicals or gluten. There’s nothing like ditching hundreds & hundreds of dollars worth of makeup, skincare & beauty products. Yes, my poor hubby saved his shampoo & conditioner, but everything else went. It was both sad & liberating. 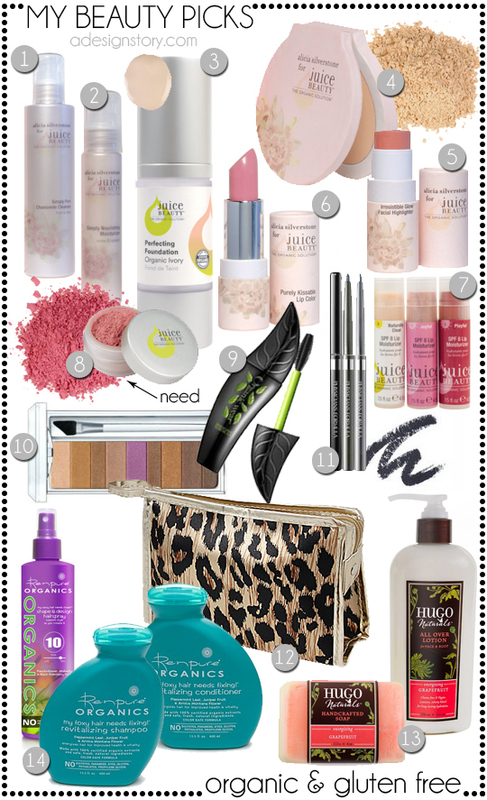 Items 1-8 come from Juice Beauty, a company that brings organic & natural makeup to the beauty market. There products are 100% gluten free… they don’t use wheat in any of the facilities.– Love that! If you have questions, find out more about the products, etc. here. One thing I love about the Juicy Beauty site is the fact they tell you exatcly what is in each product. It’s so refreshing to find a company I can trust with my face!! 1. It’s so important to have a good face wash. Alicia Silverstone actually created a collection for Juice Beauty (her line is completely vegan as well)… I actually use her entire line of products. This one is her Simply Pure Chamomile Cleanser… it smells great and leaves your skin feeling fresh. 2. I love a good moisturizer too. I love Alicia’s Simply Nourishing Moisturizer too… it leaves your face feel with a nice glow. 3. Foundation is really important to me… I have always been one to like full coverage. I picked the Juice Beauty Perfecting Foundation. I use my hands instead of the brush because it dries very, very fast. It’s a very thin foundation, but it covers well. You can also layer it if need be. I love, love, love it. It feels so light so your face never feels “caked”. 4. I like a finished “matte” look to my complexion, so I use Alicia’s Simply Flawless Pressed Powder. I apply it with a nice brush for that finished look. It too is light & soft. 5. As far as blush goes, I have been using Alicia Silverstone’s Irresistible Glow Facial Highlighter. I apply it with a concealer brush and it’s thin and very “summery”. I love that natural, “girly” look and this works great. It gives your cheeks a nice glow. I love it. 6. Since going gluten free, I stopped using most lip products. For some reason, going gluten free with my lips seemed to make sense… I still can’t believe I went so long believing I could use “regular makeup”. Anyways, that being said, I hadn’t worn lipstick until I found Juice Beauty. I LOVE, LOVE, LOVE Alicia Silverstone’s Purely Kissable Lip Color. It’s smooth, creamy and so, so, so pretty. Kevin even looked at me in the car one day and said “wow… you are wearing lipstick, I love it… you look so pretty”… is that confirmation or what?!! It made my day. 7. When I need a nice pick-me up or an SPF for my lips, I use Juice Beauty’s Tinted SPF 8 Lip Moisturizers. They rock. 8. The one thing I would still like to have is the powder blush version… the Glowing Cheek Color. It’s on my list to purchase. 9. As far as mascara goes, Juice Beauty is still formulating theirs. In the meantime, I found out that Physicians Formula has a 100% organic mascara that is gluten free. I grabbed some and I actually love it. I kept getting what my optometrist and I thought was pink eye/allergies over & over again for the last few years… little did we know that it was a gluten issue. Thank God companies are becoming more aware and developing products we gluten-free people need to stay pretty! 11. I don’t always wear eye liner because I like to stay as natural looking as possible. I just love that “fresh” look. I do wear eye liner on occasion for date’s with my incredibly handsome Mr., parties & events later in the evening. Physicians formula created the Shimmer Eyeliner collection to match the eye shadows. It goes on smooth and it doesn’t smear– which is a total plus! 12. Since ditching all of my old makeup, I picked up a new makeup bag. I like to get inexpensive bags since I change them out frequently. I opted for a leopard bag similar to this one. It’s small enough for my purse and it’s great for fall. 14. Like lipstick, shampoo and conditioner was another thing I found out about early on. When I began to go totally gluten free, since there wasn’t any in my system, my head started getting these funny bumps. I began to research and I figured I would try some gluten free shampoo & conditioner. It worked. Wow, oh wow the difference. I found Renpure’s Organic Shampoo & Conditioner at Bed,Bath & Beyond. The thing I didn’t realize was the hairspray… who would think, I mean seriously, that you need to go gluten free with hairspray. Well, it’s true. I picked up Renpure’s Organic Shape & Design Spray. It’s fab. So, there’s my lineup of gluten free & natural beauty products that I use everyday & trust. It’s been an extremely long journey going natural & gluten free, but one that’s been filled with great learning curves. After researching companies who don’t use harmful chemicals, I feel more & more thankful for the transition I was forced to make. Also, even though it has cost us a “few” dollars, tears and doctor visits later, my husband has been a wonderful support to me. Not many husband’s would be to excited to help you ditch all of your beauty products and then take you to stores to shop for an entirely new collection. He’s mine. All mine. What about you? What beauty products do you and trust? Are any of you going gluten free or natural with your products? DO TELL. p.s. I was not paid or perked for showcasing any of these products, I just love and trust them and wanted to share my finds to answer your questions! Thanks so much for sharing your list. My family is new to celiac…my son was diagnosed just a few months ago. I was told that gluten could not be ingested, but did not realize that gluten could seep into the body through shampoo or other body products. Can you tell me, how do you know which cosmetic products are gluten free? I have never seen “wheat” as an ingredient on a non food item, so is it hiding under a different term? As a rule I dont’t buy anything with any fragrances, so I thought we were doing well, but perhaps it’s time to phase them out. Thanks so much for the post! Hi Lindsay! I had no idea there could be gluten in cosmetics! I’m gluten free (although not a celiac) so I would love to learn more about gluten in non-food items. Do you have a favorite resource?